If you are going to be in NYC this New Years Eve, don’t miss this after party being put on by Disorient. If you were at the playa in 2004, Disorient, was that great camp with the domes, large LED sign, projections, amazing DJs and much much more located at 10:PM and Esplanade. 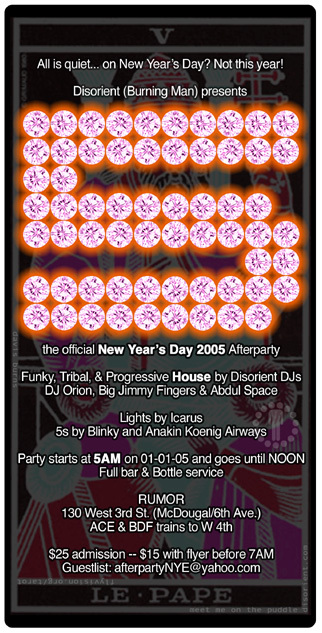 The party is from 5AM to Noon on 1/1/05. It will be THE place to end your evening.